Amp up your seasonal décor! Festive red, faux silk poinsettia blooms are accented by an array of twinkling fiber optic lights atop stems that also light up with bright and beautiful color. 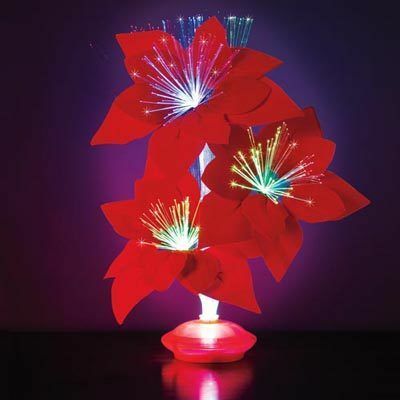 This Poinsettia Fiber Optic Flower is a merry piece for any room in the house. Line several of them up on the mantle for a unique light show, or place in the powder room to light the way during holiday gatherings. On/off switch located on base. Requires 3 AA batteries (not included.) Imported. 14"h.